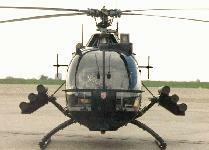 The BO 105 CBS-5 Army or Navy is a lightweight twin-engine multi-role military helicopter. 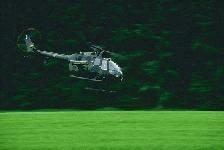 It is built by the EUROCOPTER Group, owned 70% by AEROSPATIALE France and 30% by Daimler Aerospace (DASA) of Germany. 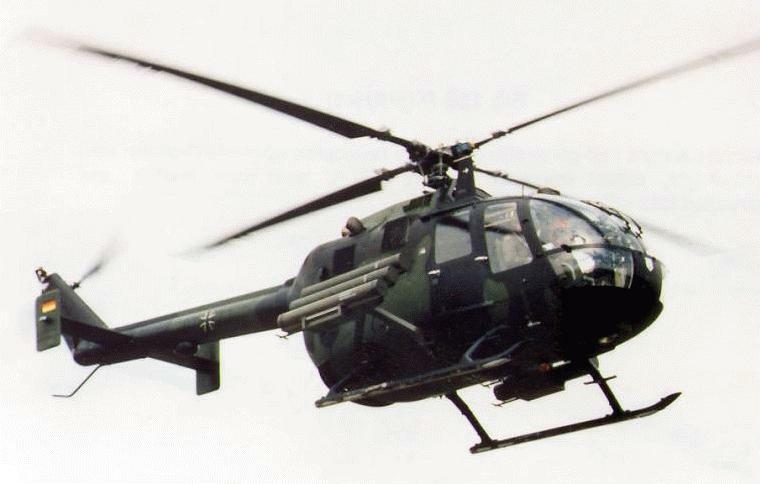 The military version of the BO 105 include the antitank version with weapon-carrying outriggers and the scout version which has a mast-mounted sight above the main rotor. 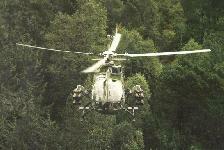 Missions include: direct air support, antitank, reconnaissance, search and rescue, and transport. In addition to reconnaissance, observation and surveillance missions, this helicopter is particularly suitable for carrying task forces and casualties, thanks to its unpartitioned cabin/cargo area. 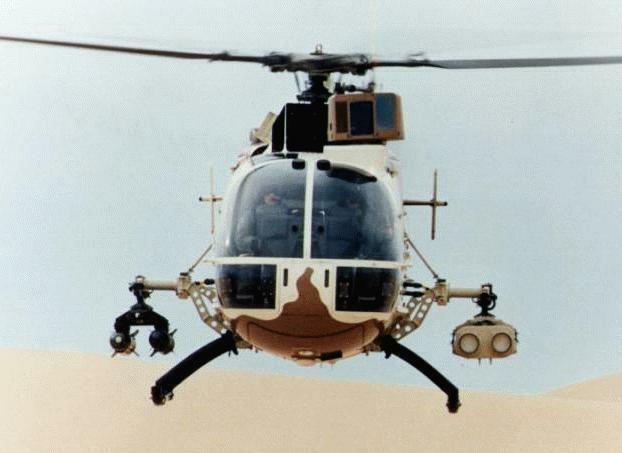 The helicopter is powered by two Allison 250-C 20B turbine engines and can easily be reconfigured for different armed duties, and particularly to support the following specific weapon systems: anti-tank missiles, rocket launchers, pod-mounted gun, gun turret, side-firing machine gun. 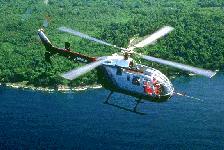 The Maritime Search & Surveillance BO 105 CBS 5, is the shipborne version of the BO 105, with the same engines. The helicopter features a 360� surveillance and watch meteorological radar, and has a capability to also support an associated data recorder and transmitter system, a Doppler/GPS navigation control system, and is NVG compatible. The four-blade main rotor is mounted above center of cabin. External stores are mounted on weapons "outriggers" or racks on each side of the fuselage. Each rack has one hardpoint. The antitank version has short, stubby, weapon-carrying outriggers on lower midsection. Two turboshaft engines are mounted on the top of the fuselage, which is short, thick, oval-shaped, and rounded at nose and rear with a glassed-in cockpit and landing skids. Clamshell doors at rear of cabin area open to access cargo area. The cargo floor has tiedown rings throughout. The tail features a swept-back and tapered fin with small rectangular fins mounted at the tips of the rectangular flats and the rotor on the left. The BO 105 was developed initially by Messerschmitt-Bolkow-Blohm in Germany. 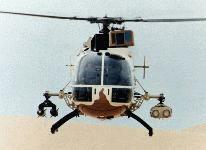 Others are built in Chile, the Philippines, Indonesia (NBO-105), and Spain (CASA BO-105/ATH). 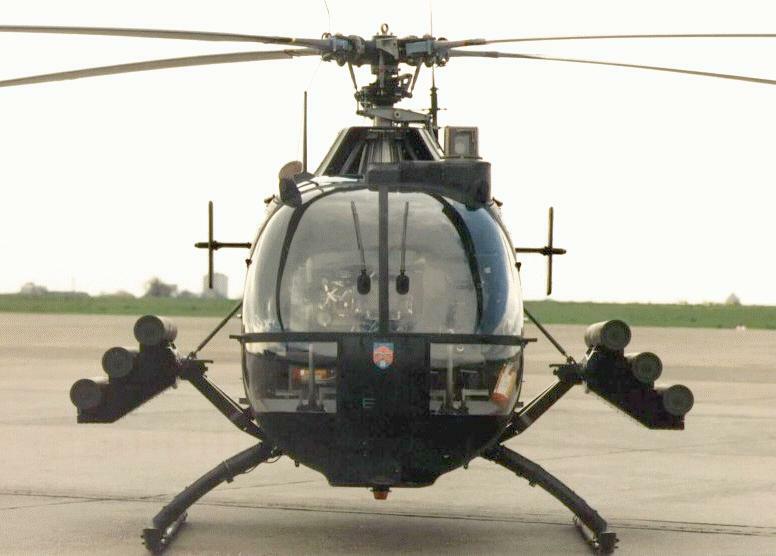 BO-105CB: The standard production variant. 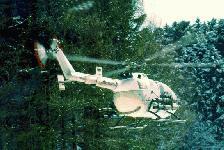 BO-105CBS: VIP version with a slightly longer fuselage to accommodate 6 passengers, some used in a SAR role. BO-105LS: Upgraded to 2x 550-shp Allison 250-C28 turboshaft engines for extended capabilities in high altitudes and temperatures. Produced only in Canada. BO-105P/PAH1: Outriggers carry 6x HOT antitank missiles, or rocket pods. CASA BO-105/ATH: The Spanish produced variant rigidly mounts 1x Rh 202 20-mm cannon under the fuselage. Transports 3 troops or 2 litters, or cargo. 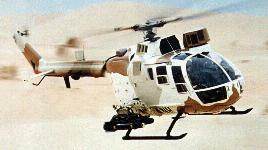 The BO-105P has a roof-mounted direct-view, daylight-only sight to allow firing of HOT ATGMs. Options exist to fit a thermal imaging system for night operations, and a laser designator. Available avionics include weather radar, Doppler and GPS navigation, and an autopilot. It is capable of operation in day, night, and instrument meteorological condi-tions.